Opened 1962 as "Civic Theatre" / "Stadskouburg", only open to white people durig the Apartheid regime. 1987-1992 major rebuilding. Reopened Sep 1992. 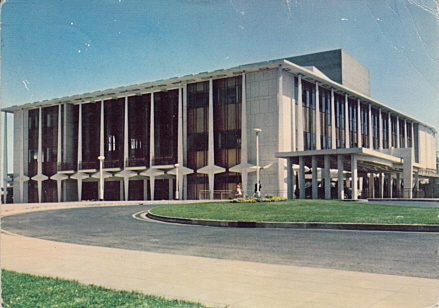 2009 renamed "Joburg Theatre". The complex includes several halls: Nelson Mandela Theatre (until 2001: Main Theatre) with 1069 seats, The Fringe (251 seats), People's Theatre (176 seats), Space.com (148 seats) and two dance studios. Reverse Text: "Johannesburg - The Civic Theatre is the new cultural centre in Johannesburg. Die Stadskouburg is die nuwe kultursentrum in Johannesburg." 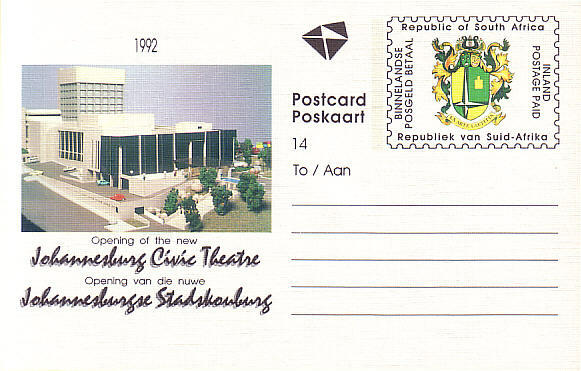 Front Text: "1992 - Opening of the new Johannesburg Civic Theatre / Opening van di nuwe Johannesburgse Stadskouburg"